I have followed Rachel Held Evans' work for years. Many of her books and blog posts have helped me through my own faith, doubt, and wandering over the past few years. Searching for Sunday in particular helped me through an incredibly low moment in my faith journey. So I was especially excited to receive a copy of her new book, Inspired. Having read recent works from Peter Enns, Rob Bell, Greg Boyd, Brian Zahnd, and others, I assumed that this might be a re-tread of these works. Namely, I thought Inspired would look at the human side of the Biblical authors, and re-interpret many long-held understandings that Christians have about the Bible. 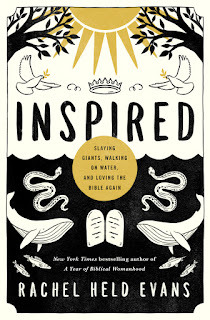 Inspired does this, but the writing is what makes this work differ from those listed above. Evans writes in a memoir style, helping the reader through her own struggles with scripture over the years. In addition, she looks to major themes of scripture, instead of focusing on the overarching story or individual themes. She spends time on the law, the violence, the gospels, and Paul. Her personal writing style and the conclusions she reaches about the Bible will help many who have themselves wrestled with scripture. Below are a couple of ideas that I greatly appreciated. Evans re-frames the "law" portions of the Old Testament (predominantly the second half of Exodus through Deuteronomy) by showing the reader that God plans to remain with his people. Normally Christians seem to put this section of scripture under two headings: 'boring' and 'troubling.' This section of the Bible is not only a dry read, but there are pieces of the law that have been used to hurt the marginalized. Evans finds hope in the law, however. She writes: "We don't tend to think of law as liberating, but for the people of Israel, these divine instructions helped forge a unique national identity, one wholly distinct from the cultures around them, including the Egyptian empire that for so long oppressed them. It reminded them, too, that the God who parted the Red Sea and conquered Pharaoh's armies was sticking around for the long haul. This is not a God who liberates, then leaves." The law shows us that God intended more than merely saving his people. God intended to be with his people. Evans' book is worth it for pages 216- 223 alone. She says that since making peace with the stories of genocides and violence and misogyny, she still had to make peace with Paul. I, too, struggle with much of what is found in Paul's letters, and I know that difficulty with Paul's letters is common for many Christians. They seem, at times, to make points that could be taken as anti-women, anti-LGBTQ, pro-slavery, etc. Evans, in ten pages, makes the best pro-Paul case that I've heard. She admits that some of his writings are troubling in a modern context, saying, "Was Paul a man of his time? Of course. But that's exactly the point. God meets us where we are, as we are. The Spirit shows up in the thick of it. We don't have to embrace everything about Paul's culture in order to embrace the good news he preached within it." Rachel Held Evans has given the world yet another book that will help many Christians, doubters, and many others in their faith walk. I'm grateful to have read it.